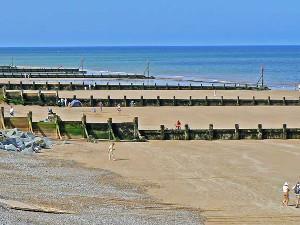 Sheringham beach01263 513811work BeachSheringham is very popular because of its fine beaches and cliffs surrounded by picturesque wooded areas to the north with views over the sea. In recent decades the North Norfolk Railway (known as the Poppy Line) has continued to develop and is now one of the main attractions of Sheringham. There are several cafes, tea rooms on the promenade. Table service or take-away is also available. •	Vehicular access is not available onto the promenade but the promenade is easily accessible from the High Street. Access is also available from the Leas Gardens and the gangway at West Cliff Gardens. •	On this award winning beach, two teams of RNLI Lifeguards operate between May-September from 10am - 6pm daily on the East and West promenade. •	Beach huts and chalets can be hired throughout the season. Sheringham is very popular because of its fine beaches and cliffs surrounded by picturesque wooded areas to the north with views over the sea. In recent decades the North Norfolk Railway (known as the Poppy Line) has continued to develop and is now one of the main attractions of Sheringham. There are several cafes, tea rooms on the promenade. Table service or take-away is also available.